Frank Draper could hit, run and field with the best of them. He also became a fine soldier. Frank Draper was one of the Bedford Boys. As the war in Europe took hold in 1940, the United States began to expand its fighting forces. In October, it was announced that Bedford's National Guard Company A would be mobilized into the federal Army for a period of one year. 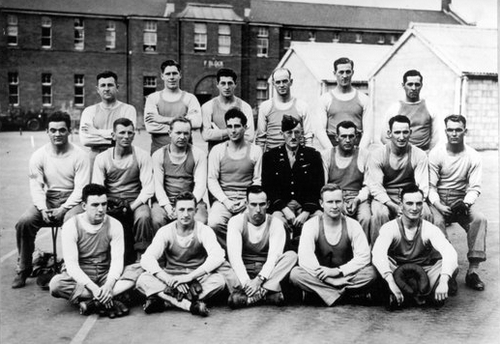 Four months later, on February 3, 1941, Draper and the other members of Company A reported to the Bedford Armory where they were issued new uniforms and sworn in. 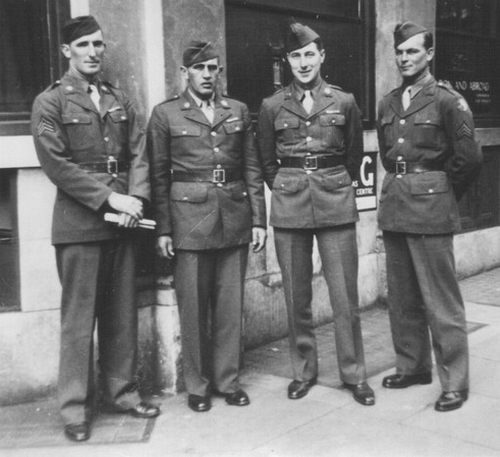 They were sent to Fort Meade, Maryland, home of the 29th Infantry Division where they were taught to be soldiers. That was to be Draper's last chance to play baseball. For the remainder of 1943 and the first five months of 1944 it was intensive military training in preparation for the invasion of mainland Europe. Of Mother so good and kind. And we couldn't tell a lie. For her we'll always learn. From the land that's home to me. far across the Ocean's brine. On the morning of June 6, 1944, Technical Sergeant Frank Draper was on a landing craft heading for Omaha Beach at Normandy. 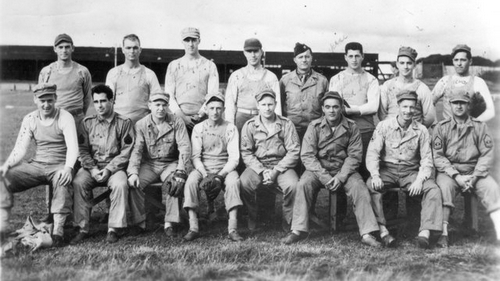 Company A of the 116th Infantry Regiment were to lead the assault on D-Day. As the landing crafts approached the beach the enemy opened fire. Draper's craft shook with the impact of an anti-personnel shell that tore off his upper arm as he stood in the middle of the craft. Rapidly losing blood, the young soldier slumped to the floor. 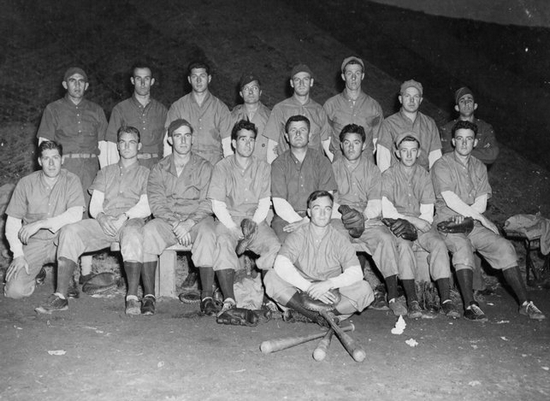 The fleet-footed outfielder from Bedford, Virginia was dead. 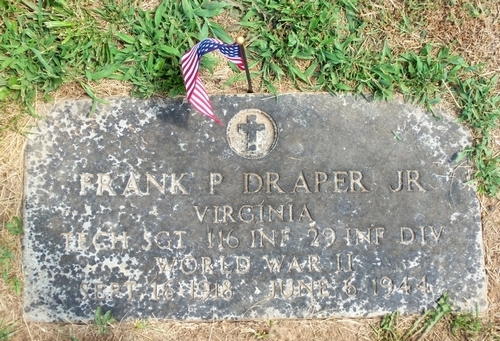 In 1947, Frank Draper's body was returned to Bedford and now rests at Greenwood Cemetery. 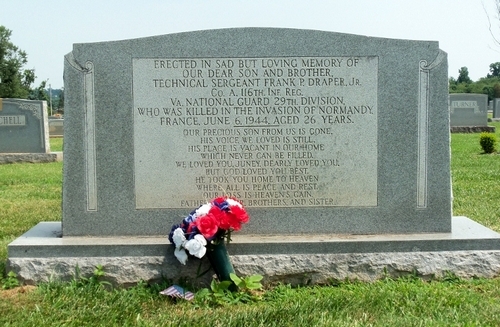 On June 6, 1954, ten years after the tragic losses at Normandy, a memorial to the Bedford boys was unveiled in the town. On June 6, 2001, the national D-Day Memorial was opened in Bedford.